What is your Assumptions Quotient? “What is your Assumptions Quotient (AQ)?” On WIN Without Competing! Dr. Arlene will host a special call-in career show with guest co-host Virgil Holder, Corporate Director of Recruitment of the prestigious Piedmont Healthcare (includes five hospitals) in Atlanta, Georgia. More than 15 million people are currently unemployed and millions of employed are shaky about their jobs and careers. Fear can cloud our judgment and prevent us from acting appropriately. Fear coupled with erroneous assumptions is deadly. To find out if you are making erroneous assumptions that are preventing you from getting a job, changing careers, or moving up in your current position, take Dr. Arlene’s Assumptions Quotient Quiz during the show. You will be amazed to find out the number of erroneous assumptions that you make which impede your career success. Are you blasting your resume from Burbank to Bombay? If so, be sure to listen to the show. 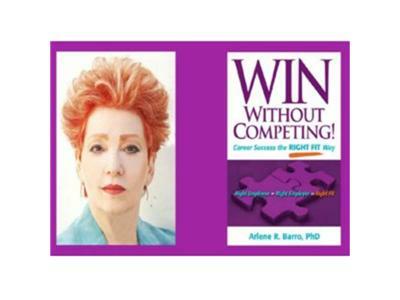 Dr. Arlene will respond to callers’ questions, demonstrating how her Right Fit Method, the subject of her book WIN Without Competing!, is the key to figuring out the right solutions to succeed in both your professional and personal life.